During my childhood, I spent most Thanksgivings in Mississippi and enjoyed the same casserole dishes that my relatives did a century ago. 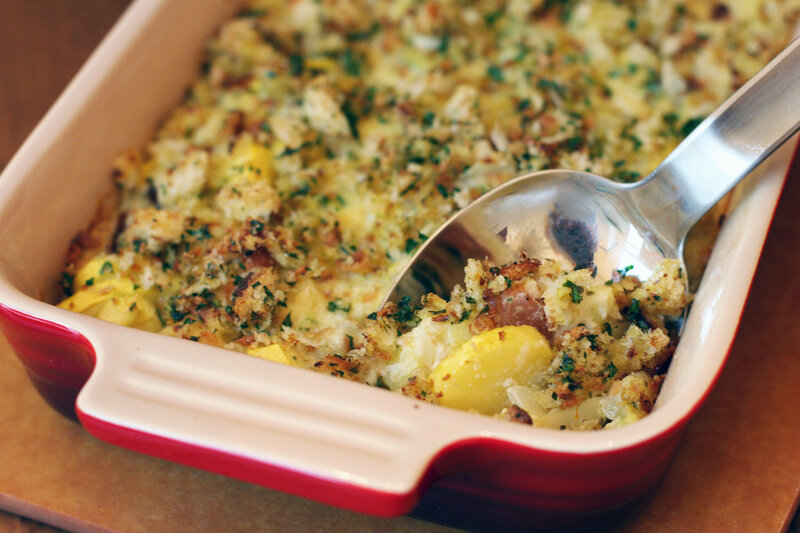 One of my favorite Thanksgiving casseroles is my great-grandmother Mama Dale’s squash casserole. 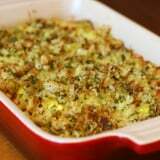 In the traditional recipe, the squash, covered in buttery Ritz crackers, cheddar cheese, and eggs, bakes into a custardy casserole that is the best “vegetable” side dish that a kid can ask for. 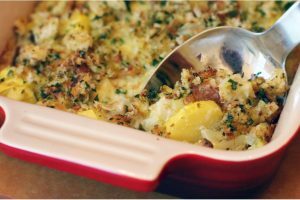 I still anxiously await digging into the pillowy, yellow fluff during the holidays, but this year I wondered how the casserole would fare with the addition of California ingredients. Living in San Francisco, I’ve become accustomed to the amazing variety of local cheeses, sourdough bread, Meyer lemons, and flourishing parsley. Using these ingredients as inspiration, I sought to remake my great-grandmother’s recipe. 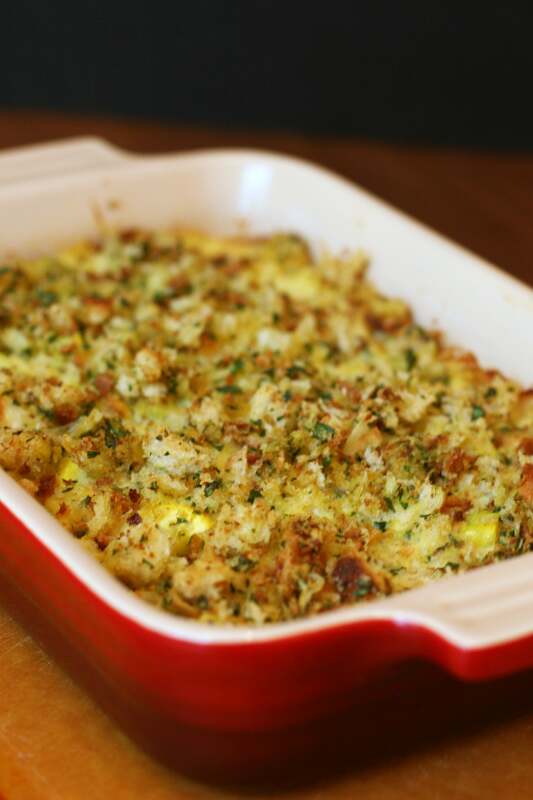 I used the same ratios of cheese, egg, vegetables, and starch, so this casserole echos Mama Dale’s original Southern recipe but with a California twist. 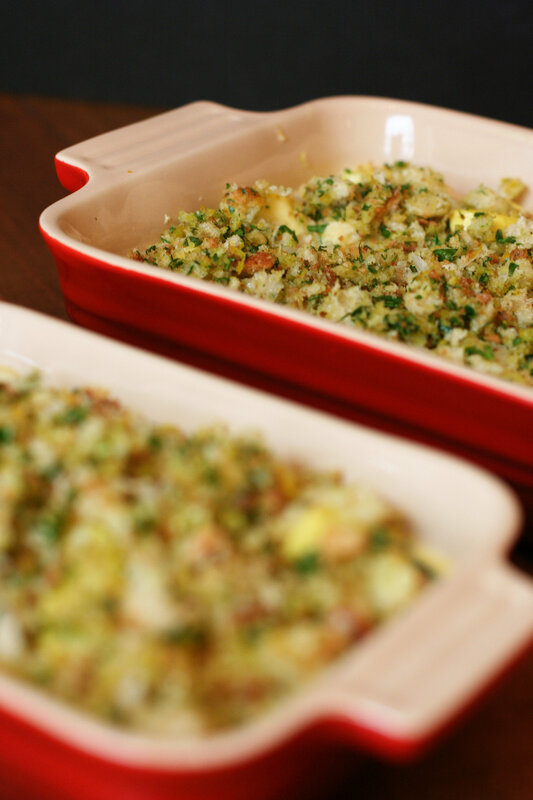 It’s startling how gremolata boosts the overall flavor of the casserole. The garlic, hint of lemon, and fresh parsley lighten up the flavors of the rich sourdough breadcrumbs soaked in butter, eggs, and milk. I used Cowgirl Creamery’s Wagon Wheel cheese for its sweet, mild, and buttery flavor, but if you don’t have access to that cheese, I’ve included several other viable options, so you can get your oozy cheesiness with each bite. This casserole goes fast, so double or triple it to make sure everyone gets their proper serving of vegetables! If you can’t locate Cowgirl Creamery’s Wagon Wheel, substitute it with a semifirm melting cheese, such as young asiago, havarti, or provolone. This casserole will keep in the fridge for several days. 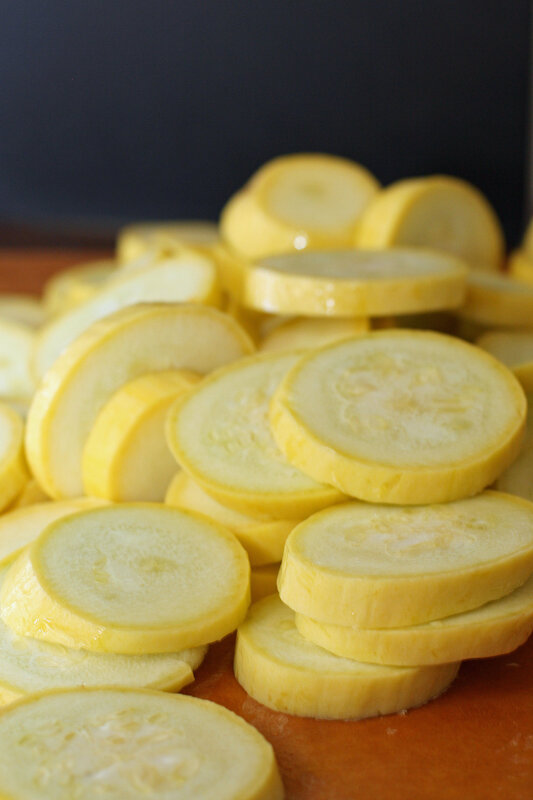 However, if you plan to freeze it ahead of time, undercook it slightly. Let it cool to room temperature, then wrap it in plastic wrap, and store it in the freezer for up to 3 months. Thaw it out in the fridge before reheating it in the oven.